When Our great customer Jesper Haugaard, a long time user of the Queen B-stick model 2b, asked us, whether it would be possible to make a more powerful rendition of that model. We decided to give it a go. 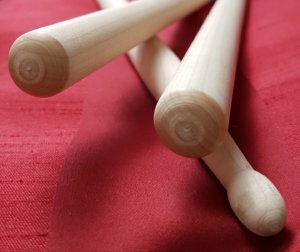 Making changes to a model, however, isn’t exactly peanuts, unless we’re dealing with large quantities, therefore since Jesper desired to order 120 sets of customized drumsticks, we chose to rise to the task. First of all, Jesper wanted a stick that was as thick as possible. Now, just to clarify, our Queen B-stick (which is made from the finest maple) 2b model is already 16,2 mm in diameter, and as such it is our thickest model already! But, Jesper’s sticks sports a whopping 16,6 mm in diameter! That’s a 0,4 mm difference! So in short, it’s a very thick stick! In addition to the customized thickness, Jesper also wanted his signature on his customized drumsticks, so we decided to throw that into the bargain! Because what is a customized drumstick without a signature? The production process of Jesper’s special order has now begun. On the pictures below, you can see the raw customized drumsticks fresh from the lathe. Now that Jesper has given his approval, it is allowing us to continue with the order. 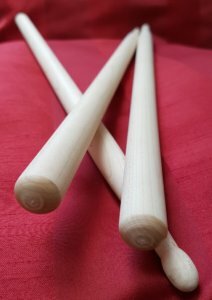 Therefore the drumsticks have now been finalized from the lathe, and they arrived in the mail yesterday. 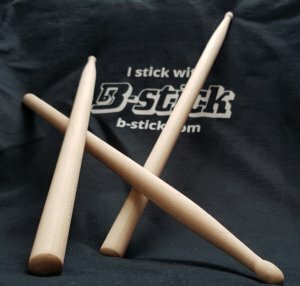 Firstly, we will have the sticks branded with our logo and Jesper’s siganture as well. Then we will start the quality testing of the sticks and pair the sticks. Stay tuned for the continued story of the customized drumsticks. Do you wanna look cool with your very own personalized signature drumsticks? Get your next order of drumsticks personalized! Choose a type and quantity, and send us your signature or band logo. Check it out now! Meet the newest B-stick family member!